All this could be achieved thanks to the new filtering engine, which we described in great detail in another article. The unified filtering engine also means shorter development cycles, we no more need to account for the nuances of this or that OS. And finally, many features that only existed for one OS can now be easilly transfered to AG products for other platforms. So expect things like Stealth Mode on Android! Most of users are using the stable version and (hopefully) are unfamiliar with this, but for those who use beta new filtering engine (see above: CoreLibs) means more crashes than usual, and to address them quickly we introduced integration with automatic crash reporting system - Sentry. 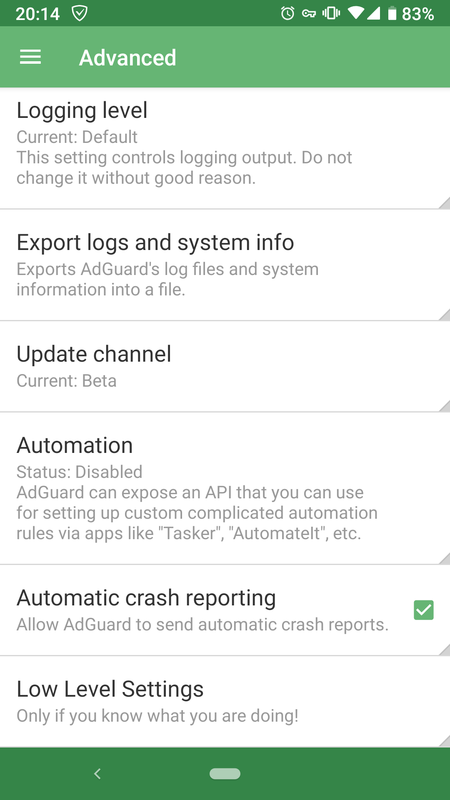 It automatically sends crash reports with all the information that developers need to fix the problem. Just so you have an idea: more than 120 CoreLibs issues have been resolved since we first added crash reporting to the beta build! You will be asked about enabling Sentry upon the first launch, or you can manually enable/disable it at any time via the app settings. It's not enough to have a working app, it should be also easy and convenient in use. And communication between the app and the user is very important. This goes both ways, and soon you'll see what I mean by it. Unfortunately, this is something that will only be available to users of Android 8 and newer, as this feature has only been introduced in the more recent Androids. 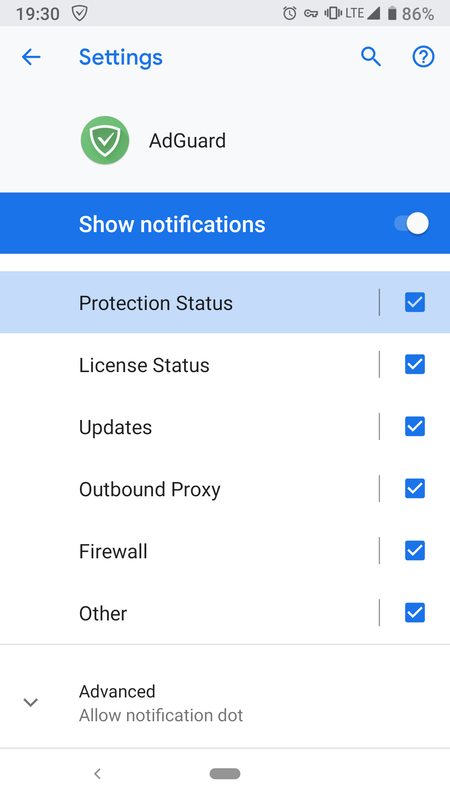 Taking advantage of this new functionality, we divided our notifications into six categories: Protection Status, License Status, Updates, Outbound Proxy, Firewall and Other. You can not only enable/disable each category separately in the system notification settings, but also manage each of them by tapping on the category name. This opens wide door for customization. Depending on what is important for you and what is not so much, you can, for example, turn some of them silent while keeping the sound for the rest. Open AG settings, go to "General" and select "Notifications"
The icon is hidden now! And this Knowledge base article will answer most of your questions about notification channels, if you have any. How to hide VPN notification on Samsung? This question goes a bit beyond the topic, but it is asked so frequently, we feel obliged to answer: swipe the VPN notification to the left, tap on the gear icon, select "VPN status" and change the importance to "Low". Another Android feature (available to users of Android 7.1+) that we made use of — long tap shortcuts. As it is obvious from the name, you just need to tap and hold on the app icon to bring up a list of fast actions. 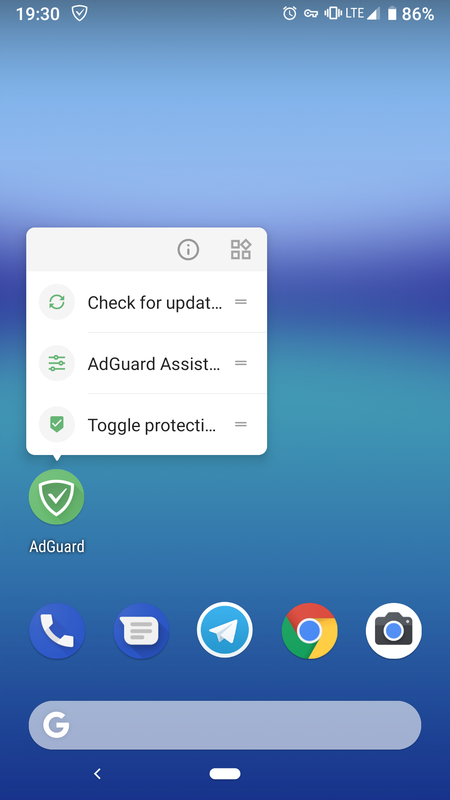 Among them are toggling the protection status, fetching AdGuard Assistant or checking for updates. 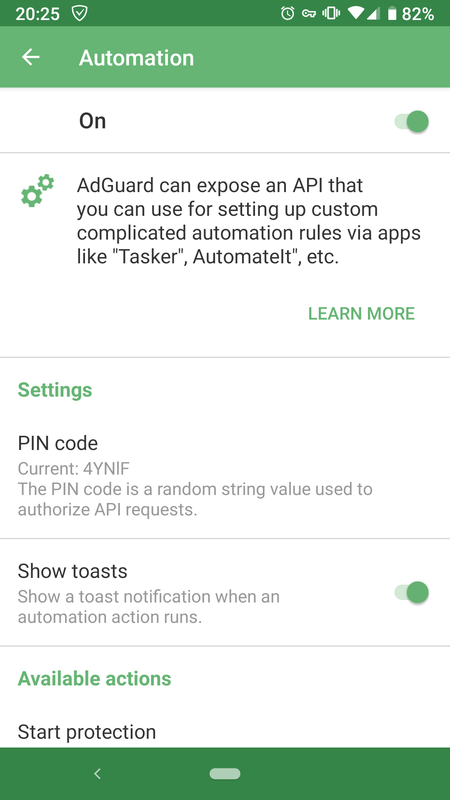 A lot of users asked us about ways to automate some of AdGuard’s functions, like disabling protection when a certain app gets launched — or some more complicated tasks like changing proxy settings. 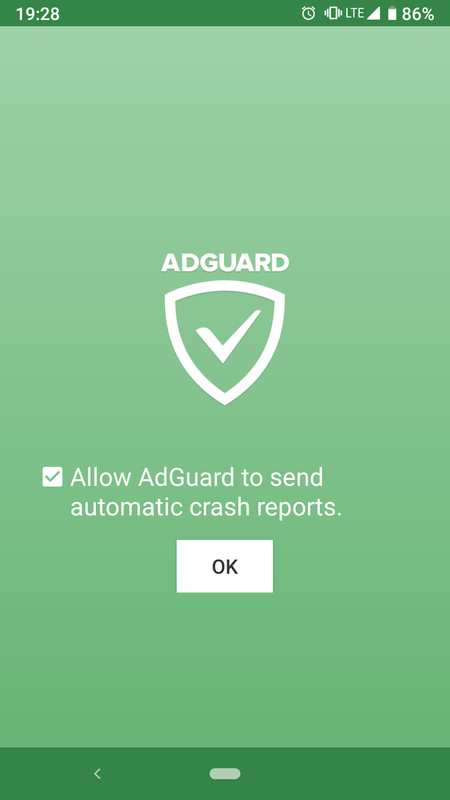 Finally, we deliver, and the in-depth guide to automating AdGuard is already available in our Knowledgebase. There are two different imrovements hiding behind one task here. First one is, we have upgraded DNSCrypt proxy to version 2. It is a general improvement, v2 is superior to v1 in speed and security. This, of course, is very far from the complete list of changes. Most of the rest of them are boring fixes and minor improvements, but if you're curious — welcome to GitHub.